Thanksgiving is here, and this post is so late..LOL! We like to discuss Halloween in our house year-round, but let me tell ya, the holiday was pretty awesome! The husband had back-to-back-to-back shows with his band, and I got to see two out of three! 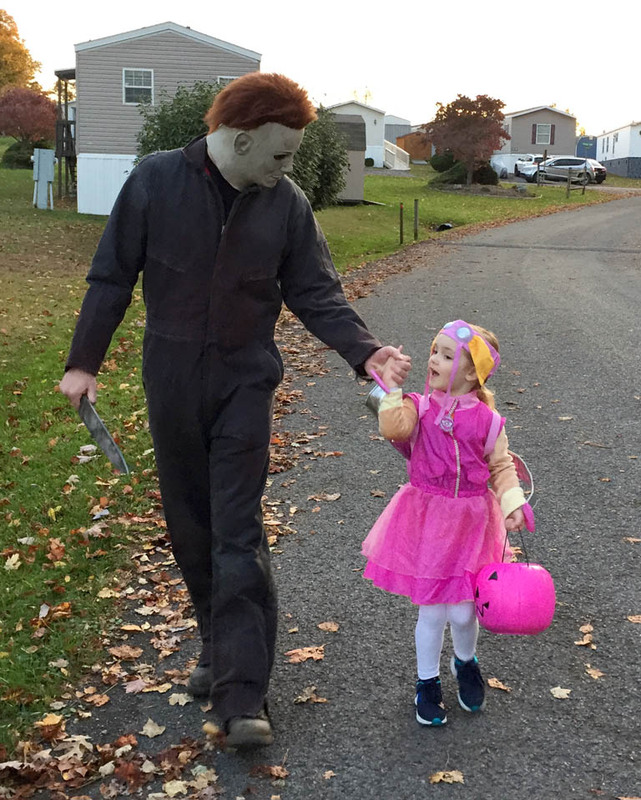 Also Alex went out on her first trick-or-treat adventure….with this guy. Go ahead, blame me for putting the Halloween theme song in your head! Yes, Michael Myers played bodyguard while all the other little ghosts and goblins stayed 10 feet away from them..LOL! Everybody in our neighborhood looks forward to trick-or-treating because they know Myers will be out giving the kids a little fright, and some candy. Mike’s been doing it for 13 years and the neighborhood kids (and the parents, too!) love it! Alex made out pretty good with the candy! She even got a big bag of candy corn from her grammy and pappy. She and I are the only two people in our house that L-O-V-E candy corn! It was her first taste of it this year and I think she now has an addiction! Love them or hate them; there’s no in-between, just like marshmallow peeps. Facebook’s been giving candy corn a bad rap around Halloween, but mostly it’s because a lot of my friends hate it, so I rejoice…that’s more candy corn for me!!! Now being stuck with 4 bags, I really candy corned myself out this past Halloween. I tried baking them in cookies last year, but failed because when you bake candy corn it melts. And due to the melting, the cookies became flat and runny-looking. Recently I was doing my nightly pinning on Pinterest when I stumbled upon Averie’s blog. 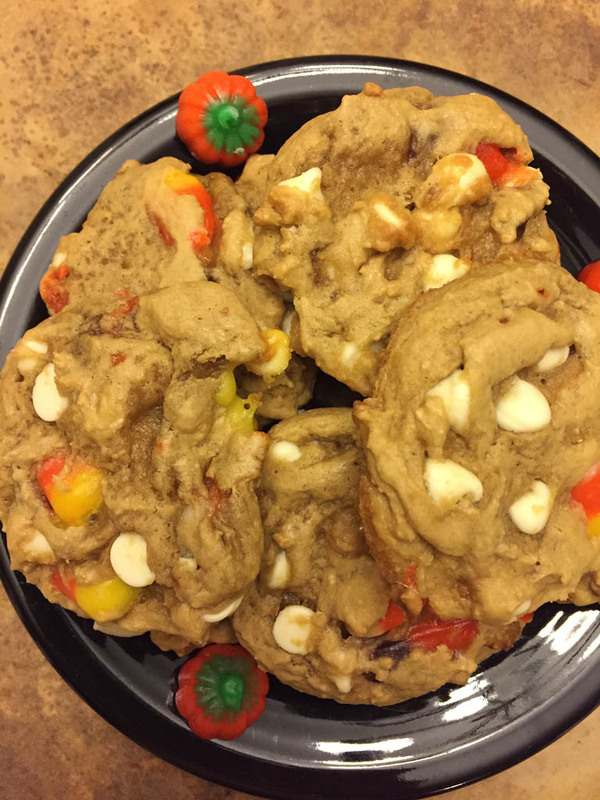 She somehow mastered baking candy corn into her cookies, so I had to read on. The secret for not having your candy corn melt is to be sure they are not exposed to the baking sheet. Sounds easy, right? Well, unless you use a lot of candy corn it can be tough. 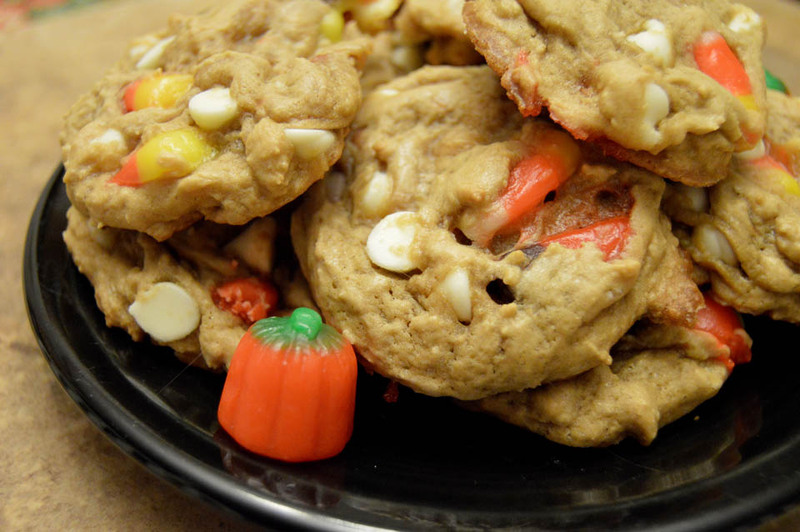 Once you scoop the cookie dough onto the baking sheet, push in exposed candy corn into the dough. 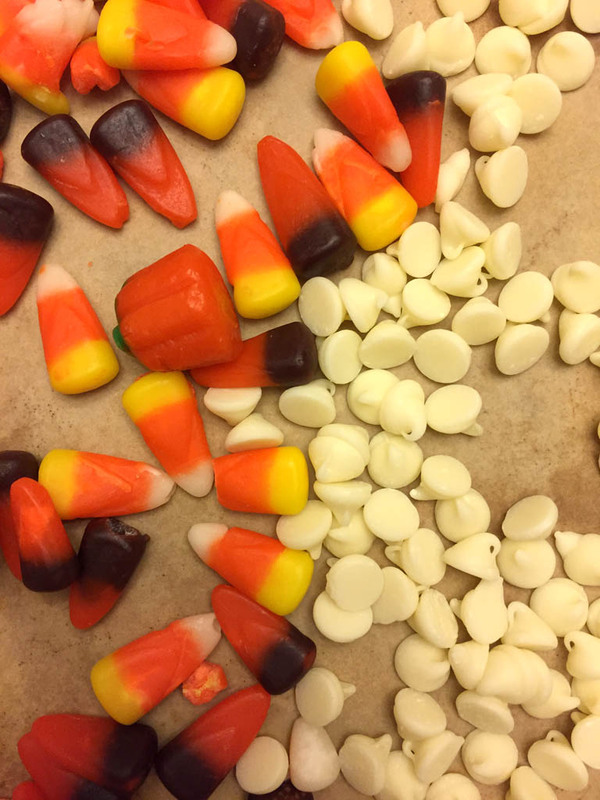 While baking, the dough helps prevent the candy corn from melting. I tried it, and a good majority of the cookies turned out great! If it wasn’t for Averie I’d still be scratching my head trying to figure it out! 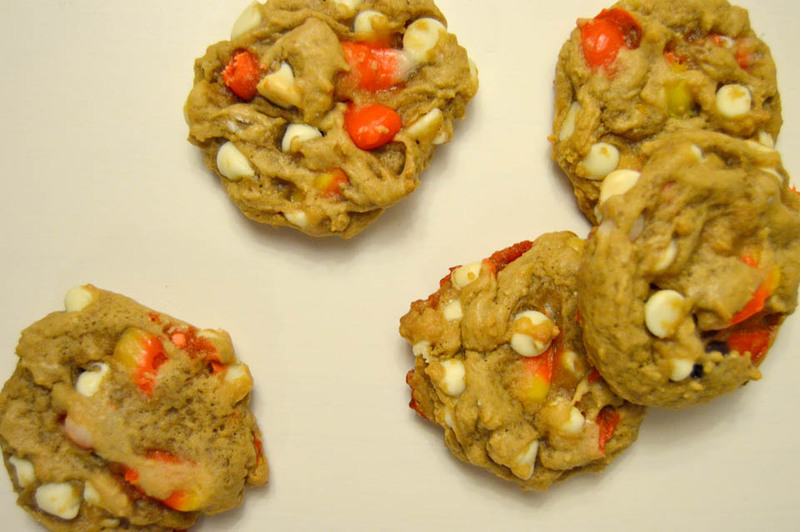 I used the same recipe for the chocolate chip cookies; I just replaced the semi-sweet morsels for one bag of white chocolate morsels and half a bag of candy corn. Have other Halloween candy to get rid of? If you got some fun-sized bags of M&Ms or Hershey bars or peanut butter cups, just cut ’em up and throw it in the dough! Kinda like the Easter cookies I made. Fast-forward from Halloween to Thanksgiving, I filled up on some turkey and mashed potatoes today and will be doing it again this weekend, and then I rev up the baking machine for Christmas! For the next month I’ll share with you some of the goodies I’ve always made with my mom growing up, and I plan to decorate the sour cream cookies the way I once did…feeling pretty nostalgic these days, the memories of family get-togethers and the food…oh the food!!! The one thing I’m oh-so thankful for is family, especially my little family who I love and support. It’s been a tough year, but we’re stronger for it. I hope you all are having a very Happy Thanksgiving, and make sure you save room for dessert! !